This article is about North Eastern Region (NER) of India. For other uses, see Northeast (disambiguation). Northeast India (officially North Eastern Region, NER) is the easternmost region of India representing both a geographic and political administrative division of the country. It comprises eight states – Arunachal Pradesh, Assam, Manipur, Meghalaya, Mizoram, Nagaland, Sikkim, and Tripura. 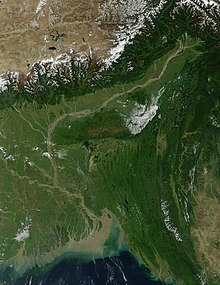 The Siliguri Corridor in West Bengal, with a width of 21 to 40 kilometres (13 to 25 mi), connects the North Eastern Region with East India. The region shares an international border of 5,182 kilometres (3,220 mi) (about 99 percent of its total geographical boundary) with several neighbouring countries – 1,395 kilometres (867 mi) with Tibet Autonomous Region, China in the north, 1,640 kilometres (1,020 mi) with Myanmar in the east, 1,596 kilometres (992 mi) with Bangladesh in the south-west, 97 kilometres (60 mi) with Nepal in the west, and 455 kilometres (283 mi) with Bhutan in the north-west. It comprises an area of 262,230 square kilometres (101,250 sq mi), almost 8 percent of that of India, and is one of the largest salients (panhandles) in the world. The states of North Eastern Region are officially recognised under the North Eastern Council (NEC), constituted in 1971 as the acting agency for the development of the north eastern states. Long after induction of NEC, Sikkim formed part of the North Eastern Region as the eighth state in 2002. India's Look-East connectivity projects connect Northeast India to China and ASEAN. Assam annexation to British India in 1838. The earliest settlers may have been Austroasiatic languages and Tibeto-Burman languages speakers from Southeast Asia, followed by Tibeto-Burmese from China and by 500 B.C. Indo-Aryans speakers from Gangetic Plains. Due to the bio- and crop diversity of the region, archaeological researchers believe that early settlers of Northeast India had domesticated several important plants. Writers believe that the 100 BC writings of Chinese explorer, Zhang Qian indicate an early trade route via Northeast India. The Periplus of the Erythraean Sea mention a people called Sêsatai in the region, who produced malabathron, so prized in the old world. In the early historical period (most of first millennium), Kamarupa straddled most of present-day Northeast India, besides Bhutan and Sylhet in Bangladesh. Xuanzang, a travelling Chinese Buddhist monk, visited Kamarupa in the 7th century. He described the people as "short in stature and black-looking", whose speech differed a little from mid-India and who were of simple but violent disposition. He wrote that the people in Kamarupa knew of Sichuan, which lay to the kingdom's east beyond a treacherous mountain. For many of the tribal peoples, their primary identification is with subtribes and villages, which have distinct dialects and cultures. The northeastern states were established during the British Raj of the 19th and early 20th centuries, when they became relatively isolated from traditional trading partners such as Bhutan and Myanmar. Many of the peoples in present-day Mizoram, Meghalaya and Nagaland converted to Christianity under the influence of British (Welsh) missionaries. In the early 19th century, both the Ahom and the Manipur kingdoms fell to a Burmese invasion. The ensuing First Anglo-Burmese War resulted in the entire region coming under British control. 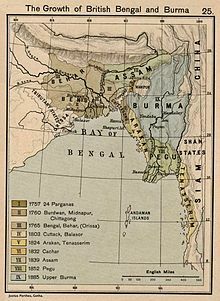 In the colonial period (1826–1947), North East India was made a part of Bengal Province from 1839 to 1873, when Assam became its own province. In 1926,it became a part of Pakokku Hill Tracts Districts of British Burma except Assam, Sikkim and Arunachal Pradesh until 1948,January 4. After Indian Independence from British Rule in 1947, the Northeastern region of British India consisted of Assam and the princely states of Manipur and Tripura. Subsequently, Nagaland in 1963, Meghalaya in 1972, Arunachal Pradesh in 1975 (capital changed to Itanagar) (formed on 20 February 1987) and Mizoram in 1987 were formed out of the large territory of Assam. Manipur and Tripura remained as Union Territories of India between 1956 until 1972, when they attained fully-fledged statehood. Sikkim was integrated as the eighth North Eastern Council state in 2002. The city of Shillong served as the capital of the Assam province created during British Rule. It remained as the capital of undivided Assam until formation of the state of Meghalaya in 1972. The capital of Assam was shifted to Dispur, a part of Guwahati, and Shillong was designated as the capital of Meghalaya. 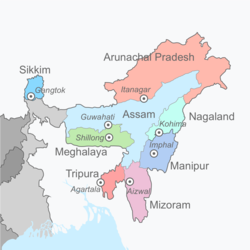 The Seven Sister States is a popular term for the contiguous states of Arunachal Pradesh, Assam, Meghalaya, Manipur, Mizoram, Nagaland and Tripura prior to inclusion of the state of Sikkim into the North Eastern Region of India. The sobriquet 'Land of the Seven Sisters' was coined to coincide with the inauguration of the new states in January 1972 by Jyoti Prasad Saikia, a journalist in Tripura, in the course of a radio talk show. He later compiled a book on the interdependence and commonness of the Seven Sister States, and named it the Land of Seven Sisters. It has been primarily because of this publication that the nickname has caught on. In 1944, the Japanese planned a daring attack on India. Traveling through Burma, its forces were stopped at Kohima and Imphal by British and Indian troops. This marked the furthest western expansion of the Japanese Empire; its defeat in this area presaged Allied victory . Arunachal Pradesh, a state in the Northeastern tip of India, is claimed by China as South Tibet. Sino-Indian relations degraded, resulting in the Sino-Indian War of 1962. The cause of the escalation into war is still disputed by both Chinese and Indian sources. During the war in 1962, the PRC (China) captured much of the NEFA (North-East Frontier Agency) created by India in 1954. But on 21 November 1962, China declared a unilateral ceasefire, and withdrew its troops 20 kilometres (12 mi) behind the McMahon Line. It returned Indian prisoners of war in 1963. The Northeast region can be physiographically categorised into the Eastern Himalaya, the Patkai and the Brahmaputra and the Barak valley plains. Northeast India (at the confluence of Indo-Malayan, Indo-Chinese, and Indian biogeographical realms) has a predominantly humid sub-tropical climate with hot, humid summers, severe monsoons, and mild winters. Along with the west coast of India, this region has some of the Indian subcontinent's last remaining rainforests, which support diverse flora and fauna and several crop species. Reserves of petroleum and natural gas in the region are estimated to constitute a fifth of India's total potential. The region is covered by the mighty Brahmaputra-Barak river systems and their tributaries. Geographically, apart from the Brahmaputra, Barak and Imphal valleys and some flatlands in between the hills of Meghalaya and Tripura, the remaining two-thirds of the area is hilly terrain interspersed with valleys and plains; the altitude varies from almost sea-level to over 7,000 metres (23,000 ft) above MSL. The region's high rainfall, averaging around 10,000 millimetres (390 in) and above creates problems of the ecosystem, high seismic activity, and floods. The states of Arunachal Pradesh and Sikkim have a montane climate with cold, snowy winters and mild summers. Kangchenjunga, the third highest mountain peak in the world rising to an altitude of 8,586 m (28,169 ft), lies in-between the state Sikkim and adjacent country Nepal. Northeast India has a subtropical climate that is influenced by its relief and influences from the southwest and northeast monsoons. The Himalayas to the north, the Meghalaya plateau to the south and the hills of Nagaland, Mizoram and Manipur to the east influences the climate. Since monsoon winds originating from the Bay of Bengal move northeast, these mountains force the moist winds upwards, causing them to cool adiabatically and condense into clouds, releasing heavy precipitation on these slopes. It is the rainiest region in the country, with many places receiving an average annual precipitation of 2,000 mm (79 in), which is mostly concentrated in summer during the monsoon season. Cherrapunji, located on the Meghalaya plateau is one of the rainiest place in the world with an annual precipitation of 11,777 mm (463.7 in). Temperatures are moderate in the Brahmaputra and Barak valley river plains which decreases with altitude in the hilly areas. At the highest altitudes, there is permanent snow cover. Temperatures vary by altitude with the warmest places being in the Brahmaputra and Barak River plains and the coldest at the highest altitudes. It is also influenced by proximity to the sea with the valleys and western areas being close to the sea, which moderates temperatures. Generally, temperatures in the hilly and mountainous areas are generally lower than the plains which lie at a lower altitude. Summer temperatures tend to be more uniform than winter temperatures due to high cloud cover and humidity. In the Brahmaputra and Barak valley river plains, mean winter temperatures vary between 16 to 17 °C (61 to 63 °F) while mean summer temperatures are around 28 °C (82 °F). The highest summer temperatures occur in the West Tripura plain with Agartala, the capital of Tripura having mean maximum summer temperatures ranging between 33 to 35 °C (91 to 95 °F) in April. The highest temperatures in summer occur before the arrival of monsoons and thus eastern areas have the highest temperatures in June and July where the monsoon arrives later than western areas. In the Cachar Plain, located south of the Brahmaputra plain, temperatures are higher than the Brahmaputra plain although the temperature range is smaller owing to higher cloud cover and the monsoons that moderate night temperatures year round. In the mountainous areas of Arunachal Pradesh, the Himalayan ranges in the northern border with India and China experience the lowest temperatures with heavy snow during winter and temperatures that drop below freezing. Areas with altitudes exceeding 2,000 metres (6,562 ft) receive snowfall during winters and have cool summers. Below 2,000 metres (6,562 ft) above sea level, winter temperatures reach up to 15 °C (59 °F) during the day with nights dropping to zero while summers are cool, with a mean maximum of 25 °C (77 °F) and a mean minimum of 15 °C (59 °F). In the hilly areas of Meghalaya, Nagaland, Manipur and Mizoram, winters are cold while summers are cool. The plains in Manipur has colder winter minimums than what is warranted by its elevation owing to being surrounded by hills on all sides. This is due to temperature inversions during winter nights when cold air descends from the hills into the valleys below and its geographic location which prevents winds that bring hot temperatures and humidity from coming into the Manipur plain. The southwest monsoon is responsible for bringing 90% of the annual rainfall to the region. April to late October are the months where most of the rainfall in Northeast India occurs with June and July being the rainiest months. Southern areas are the first to receive the monsoon (May or June) with the Brahmaputra valley and the mountainous north receiving later (later May or June). In the hilly parts of Mizoram, the closer proximity to the Bay of Bengal causes it to experience early monsoons with June being the wettest season. The North Eastern Region of India is a mega-earthquake prone zone caused by active fault planes beneath formed by the convergence of three tectonic plates viz. 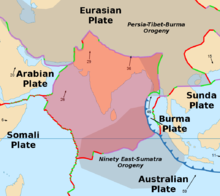 India Plate, Eurasian Plate and Burma Plate. Historically the region has suffered from two great earthquakes (M > 8.0) – 1897 Assam earthquake and 1950 Assam-Tibet earthquake – and about 20 large earthquakes (8.0 > M > 7.0) since 1897. The 1950 Assam-Tibet earthquake is still the largest earthquake in India. WWF has identified the entire Eastern Himalayas as a priority Global 200 Ecoregion. Conservation International has upscaled the Eastern Himalaya hotspot to include all the eight states of Northeast India, along with the neighbouring countries of Bhutan, southern China and Myanmar. The region has been identified by the Indian Council of Agricultural Research as a center of rice germplasm. The National Bureau of Plant Genetic Resources (NBPGR), India, has highlighted the region as being rich in wild relatives of crop plants. It is the center of origin of citrus fruits. Two primitive variety of maize, Sikkim Primitive 1 and 2, have been reported from Sikkim (Dhawan, 1964). Although jhum cultivation, a traditional system of agriculture, is often cited as a reason for the loss of forest cover of the region, this primary agricultural economic activity practiced by local tribes supported the cultivation of 35 varieties of crops. The region is rich in medicinal plants and many other rare and endangered taxa. Its high endemism in both higher plants, vertebrates, and avian diversity has qualified it as a biodiversity hotspot. 51 forest types are found in the region, broadly classified into six major types — tropical moist deciduous forests, tropical semi-evergreen forests, tropical wet evergreen forests, subtropical forests, temperate forests, and alpine forests. Out of the nine important vegetation types of India, six are found in the North Eastern Region. These forests harbor 8,000 out of 15,000 species of flowering plants. In floral species richness, the highest diversity is reported from the states of Arunachal Pradesh (5000 species) and Sikkim (4500 species) amongst the North Eastern states. According to the Indian Red Data Book, published by the Botanical Survey of India, 10 percent of the flowering plants in the country are endangered. Of the 1500 endangered floral species, 800 are reported from Northeast India. Most of the North Eastern states have more than 60% of their area under forest cover, a minimum suggested coverage for the hill states in the country in order to protect from erosion. Northeast India is a part of Indo-Burma hotspot. This hotspot is the second largest in the world, next only to the Mediterranean Basin, with an area 2,206,000 square kilometres (852,000 sq mi) among the 25 identified. The International Council for Bird Preservation, UK identified the Assam plains and the Eastern Himalaya as an Endemic Bird Area (EBA). The EBA has an area of 220,000 km2 following the Himalayan range in the countries of Bangladesh, Bhutan, China, Nepal, Myanmar and the Indian states of Sikkim, northern West Bengal, Arunachal Pradesh, southern Assam, Nagaland, Manipur, Meghalaya and Mizoram. Because of a southward occurrence of this mountain range in comparison to other Himalayan ranges, this region has a distinctly different climate, with warmer mean temperatures and fewer days with frost, and much higher rainfall. This has resulted in the occurrence of a rich array of restricted-range bird species. More than two critically endangered species, three endangered species, and 14 vulnerable species of birds are in this EBA. Stattersfield et al. (1998) identified 22 restricted range species, out of which 19 are confined to this region and the remaining three are present in other endemic and secondary areas. Eleven of the 22 restricted-range species found in this region are considered as threatened (Birdlife International 2001), a number greater than in any other EBA of India. The total population of Northeast India is 46 million with 68 percent of that living in Assam alone. Assam also has a higher population density of 397 persons per km² than the national average of 382 persons per km². The literacy rates in the states of the Northeastern region, except those in Arunachal Pradesh and Assam, are higher than the national average of 74 percent. As per 2011 census, Meghalaya recorded the highest population growth of 27.8 percent among all the states of the region, higher than the national average at 17.64 percent; while Nagaland recorded the lowest in the entire country with a negative 0.5 percent. Northeast India constitutes a single linguistic region within the Indian national context, with about 220 languages in multiple language families (Indo-European, Trans-Himalayan/Sino-Tibetan, Kra–Dai, Austroasiatic, as well as some creole languages) that share a number of features that set them apart from most other areas of the Indian subcontinent (such as alveolar consonants rather than the more typical dental/retroflex distinction). Assamese, an Indo-Aryan language spoken mostly in the Brahmaputra Valley, developed as a lingua franca for many speech communities. Assamese-based pidgin/creoles have developed in Nagaland (Nagamese) and Arunachal (Nefamese), though their use has been on a decline in recent times. 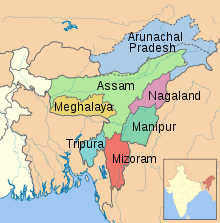 The Austro-Asiatic family is represented by the Khasi, Jaintia and War languages of Meghalaya. A small number of Tai–Kadai languages (Ahom, Tai Phake, Khamti, etc.) are also spoken. Trans-Himalayan/Sino-Tibetan is represented by a number of languages that differ significantly from each other, some of which are: Bodo, Rabha, Karbi, Mising, Tiwa, Deori, Biate etc. (Assam); Garo, Hajong, Biate (Meghalaya) Ao, Angami, Sema, Lotha, Konyak etc. 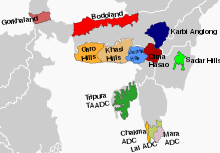 (Nagaland); Mizo, Hmar, Chakma (Mizoram); Hrusso, Tanee, Nisi, Adi, Abor, Nocte, Apatani, Misimi etc. (Arunachal). Meitei is the official language in Manipur, the dominant language of the Imphal Valley; while "Naga" languages such as Poumai, Mao, Maram, Rongmei (Kabui) and Tangkul, and Kuki-Chin languages such as Thadou-Kuki, Hmar, Simte and Paite predominate in individual hill areas of the state. Among other Indo-Aryan languages, Bengali is spoken in South Assam in the Barak Valley. Besides the Sino-Tibetan Tripuri language, Bengali is a majority language in Tripura. Nepali, an Indo-Aryan language, is dominant in Sikkim, besides the Sino-Tibetan languages Limbu, Bhutia and Lepcha. Bengali was the official language of Colonial Assam for about forty years from the 1830s. Given the diverse population in the region with only a few widely spoken ones recognised as the official languages by both the state and central governments, a large number of languages from the North Eastern Region of India have become vulnerable. Without proper teaching and preservation efforts, the already underdeveloped literature of the endangered languages are on the verge of extinction. Additionally, the younger generation are rapidly adopting the widely spoken languages to secure employment and livelihood. Northeast India has over 220 ethnic groups and equal number of dialects in which Bodo form the largest indigenous ethnic group. The hills states in the region like Arunachal Pradesh, Meghalaya, Mizoram, and Nagaland are predominantly inhabited by tribal people with a degree of diversity even within the tribal groups. The region's population results from ancient and continuous flows of migrations from Tibet, Indo-Gangetic India, the Himalayas, present Bangladesh, and Myanmar. Sattriya (from Assam) and Manipuri dance (from Manipur) have been listed as classical dances of India. Besides these, all tribes in Northeast India have their own folk dances associated with their religion and festivals. The tribal heritage in the region is rich with the practice of hunting, land cultivation and indigenous crafts. The rich culture is vibrant and visible with the traditional attires of each community. All states in Northeast India share the handicrafts of bamboo and cane, wood carving, making traditional weapons and musical instruments, pottery and handloom weaving. Traditional tribal attires are made of thick fabrics primarily with cotton. Assam silk is a famous industry in the region. The northeastern states, having 3.8% of India's total population, are allotted 25 out of a total of 543 seats in the Lok Sabha. This is 4.6% of the total number of seats. In 1947 Indian independence and partition resulted in the North East becoming a landlocked region. This exacerbated the isolation that has been recognized, but not studied. East Pakistan controlled access to the Indian Ocean. The mountainous terrain has hampered the construction of road and railways connections in the region. Several militant groups have formed an alliance to fight against the governments of India, Bhutan, and Myanmar, and now use the term "Western Southeast Asia" (WESEA) to refer to the region. The separatist groups include the Kangleipak Communist Party (KCP), Kanglei Yawol Kanna Lup (KYKL), People's Revolutionary Party of Kangleipak (PREPAK), People's Revolutionary Party of Kangleipak-Pro (PREPAK-Pro), Revolutionary People's Front (RPF) and United National Liberation Front (UNLF) of Manipur, Hynniewtrep National Liberation Council (HNLC) of Meghalaya, Kamatapur Liberation Organization (KLO), which operates in Assam and North Bengal, National Democratic Front of Bodoland and ULFA of Assam, and the National Liberation Front of Tripura (NLFT). The Ministry of Development of North Eastern Region (MDoNER) is the deciding body under Government of India for socio-economic development in the region. The North Eastern Council under MDoNER serves as the regional governing body for Northeast India. The North Eastern Development Finance Corporation Ltd. (NEDFi) is a Public Limited Company providing assistance to micro, small, medium and large enterprises within the northeastern region (NER). Other organizations under MDoNER include North Eastern Regional Agricultural Marketing Corporation Limited (NERAMAC), Sikkim Mining Corporation Limited (SMC) and North Eastern Handlooms and Handicrafts Development Corporation (NEHHDC). The economy is agrarian. Little land is available for settled agriculture. Along with settled agriculture, jhum (slash-and-burn) cultivation is still practised by a few indigenous groups of people. The inaccessible terrain and internal disturbances has made rapid industrialisation difficult in the region. Northeast India is also the home of many Living root bridges. In Meghalaya, these can be found in the southern Khasi and Jaintia Hills. They are still widespread in the region, though as a practice they are fading out, with many examples having been destroyed in floods or replaced by more standard structures in recent years. Living root bridges have also been observed in the state of Nagaland, near the Indo-Myanmar border. Northeast India has several newspapers in both English and regional languages. The largest circulated English daily in Assam is The Assam Tribune. In Meghalaya, The Shillong Times is the highest circulated newspaper. In Nagaland, Nagaland Post has the highest number of readers. G Plus is the only print and digital English weekly tabloid published from Guwahati. In Manipur, Imphal Free Press is a highly respected newspaper. in Arunachal Pradesh, The Arunachal Times is the highest circulated newspaper in Arunachal Pradesh. States in the North Eastern Region are well connected by air-transport conducting regular flights to all major cities in the country. The states also own several small airstrips for military and private purposes which may be accessed using Pawan Hans helicopter services. The region currently has two international airpots viz. 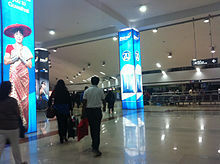 Lokapriya Gopinath Bordoloi International Airport and Bir Tikendrajit International Airport conducting flights to Thailand, Myanmar, Nepal and Bhutan. While the airport in Sikkim is under-construction, Bagdogra Airport (IATA: IXB, ICAO: VEBD) remains the closest domestic airport to the state. Railway in Northeast India is delineated as Northeast Frontier Railway zone of Indian Railways. The regional network is underdeveloped with the states of Manipur, Meghalaya, Mizoram, Nagaland and Sikkim remaining almost disconnected till date (11 June 2017). However, projects are underway to extend the network and connect all the capital cities in the region. In the 21st century, there has been recognition among policymakers and economists of the region that the main stumbling block for economic development of the Northeastern region is the disadvantageous geographical location. It was argued that globalisation propagates deterritorialisation and a borderless world which is often associated with economic integration. With 98 percent of its borders with China, Myanmar, Bhutan, Bangladesh and Nepal, Northeast India appears to have a better scope for development in the era of globalisation. As a result, a new policy developed among intellectuals and politicians that one direction the Northeastern region must be looking to as a new way of development lies with political integration with the rest of India and economic integration with the rest of Asia, with East and Southeast Asia in particular, as the policy of economic integration with the rest of India did not yield much dividends. With the development of this new policy, the Government of India directed its Look East policy towards developing the Northeastern region. This policy is reflected in the Year End Review 2004 of the Ministry of External Affairs, which stated that: "India’s Look East Policy has now been given a new dimension by the UPA Government. India is now looking towards a partnership with the Association of Southeast Asian Nations ASEAN countries, both within BIMSTEC and the India-ASEAN Summit dialogue as integrally linked to economic and security interests, particularly for India’s East and North East region." ^ "Indian cities by population" (PDF). ^ a b "Problems of border areas in Northeast India" (PDF). ^ "North Eastern Council". Archived from the original on 15 April 2012. Retrieved 25 March 2012. ^ a b "Integration of Sikkim in North Eastern Council". Times of India. 10 December 2002. Retrieved 25 March 2012. ^ "Evaluation of NEC funded projects in Sikkim" (PDF). NEC. ^ "Formation of Assam during British rule in India". Retrieved 25 March 2012. ^ "Formation of North Eastern states from Assam". Retrieved 25 March 2012. ^ "Shillong becomes the capital of Meghalaya". Retrieved 25 March 2012. ^ a b c d e "The North Eastern Areas (Re-organisation Act) 1971" (PDF). meglaw.gov.in. ^ "Ancient name of Manipur". ^ "Historical evolution of Mizoram" (PDF). ^ "The Seven Sisters". Retrieved 2015-07-30. ^ Saikia, J. P (1976). The Land of seven sisters. Place of publication not identified: Directorate of Information and Public Relations, Assam. OCLC 4136888. ^ Dikshit 2014, p. 150. ^ Dikshit 2014, p. 151. ^ a b c d e f Dikshit 2014, p. 152. ^ a b c Dikshit 2014, p. 153. ^ a b c d e Dikshit 2014, p. 156. ^ a b Dikshit 2014, p. 158. ^ a b c Dikshit 2014, p. 155. ^ a b Dikshit 2014, p. 157. ^ a b c d Dikshit 2014, p. 160. ^ "North-east India hit by 6.7 magnitude earthquake". ^ Hedge 2000, FSI 2003. ^ "Kaziranga National Park – a world heritage site, Govt. of Assam" (PDF). ^ "A note on non-human primates of Murlen National Park, Mizoram, India" (PDF). Zoological Survey of India. 106 (Part-1): 111–114. ^ "Forest types of Mizoram". ^ "Nagaland records negative decadal growth". ^ "IITG - Hierarchy of North Eastern Languages". ^ "Report On North East India" (PDF). ^ "Endangered languages of North-east India". ^ "Population By Religious Community". ^ a b "Northeast India craft forms – nelive.in". ^ a b "Arunachal Pradesh". ^ a b c d e f g "Arts and crafts of North-east India". ^ "Popular dances of Meghalaya". ^ a b c "Culture of Sikkim – sikkimonline.in". ^ "Folk dances of Sikkim". ^ "Autonomous District Councils of Manipur". ^ "Manipur District Council Act 1971". ^ Seventh Kamal Kumari Memorial Lecture. ^ "11 rebel groups call for Republic Day boycott". The Times Of India. Retrieved 9 September 2014. ^ "NE rebels call general strike on I-Day". The Sangai Express. Archived from the original on 9 September 2014. Retrieved 9 September 2014. ^ "Living Root Bridges". Cherrapunjee. Retrieved 2017-09-11. ^ "The Living Root Bridge Project". The Living Root Bridge Project. Retrieved 2017-09-11. ^ "The Living-Root Bridge: The Symbol Of Benevolence". Riluk. 2016-10-10. Retrieved 2017-09-11. ^ "Why is Meghalaya's Botanical Architecture Disappearing?". The Living Root Bridge Project. 2017-04-06. Retrieved 2017-09-11. ^ "Living Root Bridges of Nagaland India – Nyahnyu Village Mon District | Guy Shachar". guyshachar.com. Retrieved 2017-09-11. 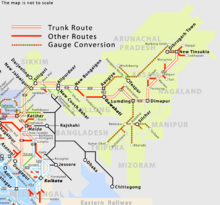 ^ "The Northeast India terribly needs a sustainable transport system – Swarajya". ^ Sachdeva, Gulshan. Economy of the North-East: Policy, Present Conditions and Future Possibilities. New Delhi: Konark Publishers, 2000, p. 145. ^ Thongkholal Haokip, India’s Northeast Policy: Continuity and Change Archived 28 April 2017 at the Wayback Machine, Man and Society – A Journal of North-East Studies, Vol. VII, Winter 2010, pp. 86–99. ^ Year End Review 2004, Ministry of External Affairs, Government of India. New Delhi. Casson, Lionel (1989). The Periplus Maris Erythraei: Text With Introduction, Translation, and Commentary. Princeton University Press. ISBN 978-0-691-04060-8. Dikshit, K.; Dikshit, Jutta (2014). "Weather and Climate of North–East India". North–East India: Land, People and Economy. Springer Netherlands. pp. 149–173. doi:10.1007/978-94-007-7055-3_6. ISBN 978-94-007-7054-6. Grierson, George A. (1967) . "Assamese". Linguistic Survey of India. Volume V, Indo-Aryan family. Eastern group. New Delhi: Motilal Banarasidass. pp. 393–398. Watters, Thomas (1905). Davids, T. W. Rhys; Bushell, S. W., eds. On Yuan Chwang's Travels in India. 2. London: Royal Asiatic Society. Retrieved 29 January 2013. Wikimedia Commons has media related to North East India.